Author: Miller, Alex Set In . . . Description: "There is a moment in our lives when we must decide which world we belong to. The world of our dreams or the other one. We can't all drift back and forth between them without risking losing our place in both." From one of Australia's most revered contemporary authors comes the romantic saga of Emily Stanton and her restless struggle against the conventions of her time. When Alex Miller's mother died several years ago, she left him the fragmentary journal she'd kept while living briefly in Paris as a young woman in the 1920s. 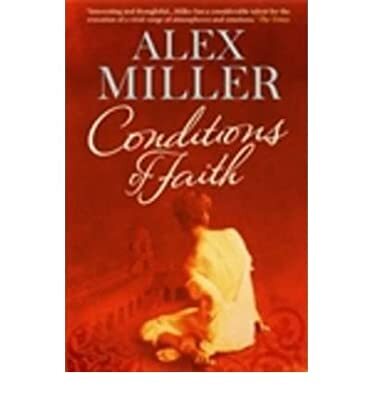 Inspired by this surprising entrée into his mother's emotional life and her conflicted passions of young womanhood, Miller has written Conditions of Faith. In spare, precise prose, Miller brings us into vivid 1920s Australia, France, and Tunisia and gives us a taste of feminism at the beginning of the century through the story of Emily Stanton. Like Henry James's Isabel Archer before her, Emily is beautiful and headstrong, restless, idealistic, and determined to live a fulfilling life despite smothering social conventions. It's 1923 and at age twenty-five, Emily, an Australian, impulsively marries Georges Elder, a French-Scottish engineer ten years her senior. Suddenly she is propelled from Melbourne, where she is a promising scholar of classical civilizations, to Georges's small, conventional flat in Paris. Quickly dismayed at the traditional life she has married into, Emily resolves to look elsewhere for the exotic adventure and intellectual stimulation she believes to be her due. She will "live a Parisian fairy story," she determines, which suits her until it leads to an illicit liaison and unwanted pregnancy, altering her life irrevocably. At the center of the book is "the problem of a reason for living," a problem that society says should be solved, for women, by motherhood. For Emily, though, it's not sufficient. Her search for fulfillment will take her as far as the ruins of Carthage and ultimately challenge society's most deeply cherished beliefs about motherhood and family. Conditions of Faith is at once a provocative romance and an elegant meditation on a timeless dilemma.